On an August morning in Belfast, Ireland during the mid-‘70s, a member of the I.R.A. named Danny Lennon was speeding down Finaghy Road North and was shot dead by British soldiers chasing him in hot pursuit. His car careened into a young mother named Anne Maguire who was walking down the road with her kids. The collision killed three of her four children. Incidents such as these, referred to as “The Troubles” since the 1960s, were tragically common in Northern Ireland. Simplistically, Northern Ireland was a deeply conflicted society due to divided loyalties. A self-governing province of the U.K., Northern Ireland was dominated economically and politically by Protestants. This did not sit well with Republican Catholics, who felt the British had no business being in Northern Ireland in the first place. Violence and bloodshed on some scale were almost everyday occurrences in Northern Ireland, but for some reason the deaths of the Maguire children set off a chain reaction of peaceful protest and solidarity in the community. The next day, 50 women from Republican neighborhoods marched pushing baby carriages to protest I.R.A. violence. That same evening, Anne Maguire’s sister, Mairead Corrigan, made a television appearance to plead for an end to the senseless bloodshed. Watching Mairead Corrigan’s emotional television supplication was a woman named Betty Williams, who was so moved by what she saw that she began petitioning door-to-door to end the sectarian violence in Northern Ireland. She amassed an amazing 6,000 signatures in just a few days, which led to the first demonstration by what would come to be known as the Peace People. On August 14, 1976, 10,000 Catholic and Protestant women gathered together and marched down Finaghy Road North, where the Maguire children were killed, to where the children were buried in Milltown Cemetery. They carried banners and moved in silence, broken only by the occasional singing from the nuns in the crowd. We have a simple message to the world from this movement for Peace. We want to live and love and build a just and peaceful society. We want for our children, as we want for ourselves, our lives at home, at work, and at play to be lives of joy and Peace. We recognise that to build such a society demands dedication, hard work, and courage. We recognise that there are many problems in our society which are a source of conflict and violence. We recognise that every bullet fired and every exploding bomb make that work more difficult. We reject the use of the bomb and the bullet and all the techniques of violence. We dedicate ourselves to working with our neighbours, near and far, day in and day out, to build that peaceful society in which the tragedies we have known are a bad memory and a continuing warning. Over the next four months, the Peace People organized 26 marches in Northern Ireland, the Republic of Ireland, and Great Britain involving both Protestant and Catholic participants. Not all Irish Republicans were thrilled with the Peace People’s ideology as it called for the dismantling of the I.R.A., but over the course of the years sectarian violence did decrease drastically in Northern Ireland. 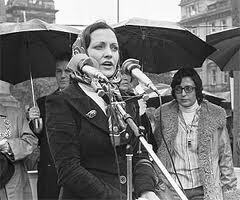 For their efforts, Betty Williams and Mairead Corrigan were awarded the Nobel Peace Prize in 1977. Thanks for this informative essay. (1) Nowhere in the article is there an explanation of what is meant by the word, “Republican,” even though such an explanation is needed, especially for the young, non-Irish people who are visiting this page. Young U.S. readers especially could be puzzled, wondering whether or not there is an extension of America’s Republican Party in Ireland. (2) The quoted sentence makes it appear that only Republican Catholics (and not Republican Protestants nor Republican non-Christians) want British dominance, especially its military presence, to end. In fact, all Republicans, regardless of their religion, want the British to leave, so that the entire island can be a single nation.